Ceramist Lilia Venier, of Venier Gallery Ceramic Art, is a relative newcomer to her art, although her work would seem to belie that fact. Originally from Tlaxcala, Mexico, Lilia’s been in the United States for 15 years, and creating ceramics that reflect that rich heritage for a mere 10 years. Her shop in downtown LA’s Little Tokyo has been open only a couple of months, but it’s a tiny jewel box nestled mid-block between Japanese noodle houses and curio shops. Behind its bright lime green façade, Lilia’s sells an amazing array of handmade pieces, most of them by herself. 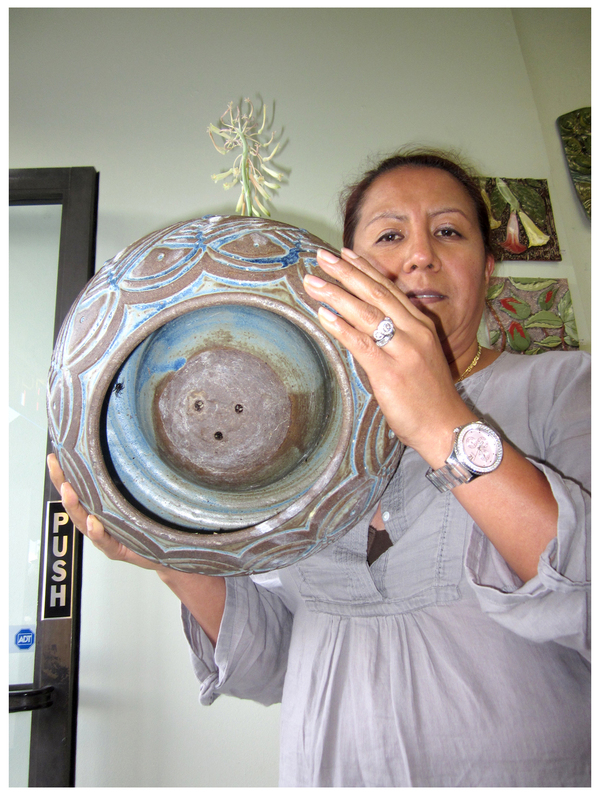 Viewing her pieces one can see she clearly has a lively sense of color as well as a facility with clay that allows her to explore her imagination; her pieces have all the textural interest, color and sense of design of a lifelong ceramist, with a distinctly Mexican graphic edge. 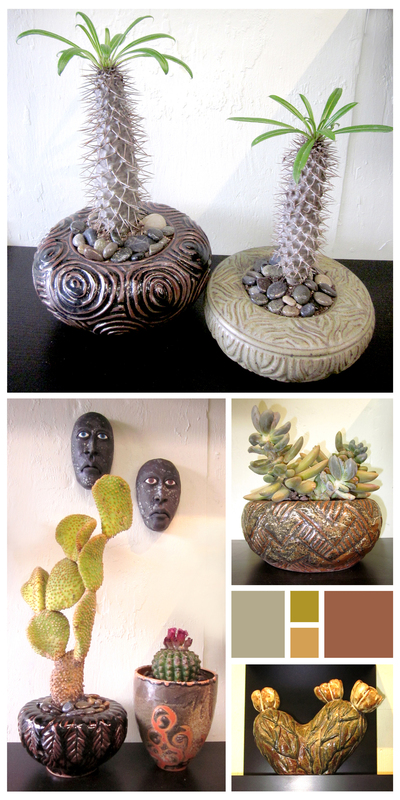 The focus of this post is the variety of planter pots she has on offer, most containing succulents. The perfect complement to the diverse forms and colors of juicy-leafed plants, these pots would make a perfect gift for yourself or someone else. A selection of Lilia’s pots from the cooler end of the spectrum, from palest blue-green to deep cobalt. I love the strength of a repeated graphic element, and, as shown here, the scallops, diagonals and petal shapes on the outside of the pots, offset nicely the shapes of the plants inside them. 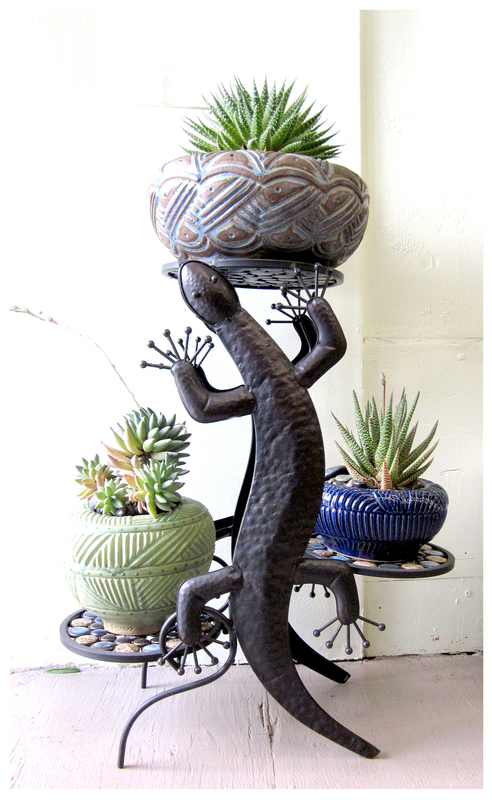 Lilia employs a variety of firing techniques and glazes to achieve her finished products and these, along with her deeply-etched designs, add to the must-be-touched surfaces of her ceramics. More earth-bound in hue, these pots range from palest sand to deep russet, with ochre and fiery orange undertones smoldering underneath. 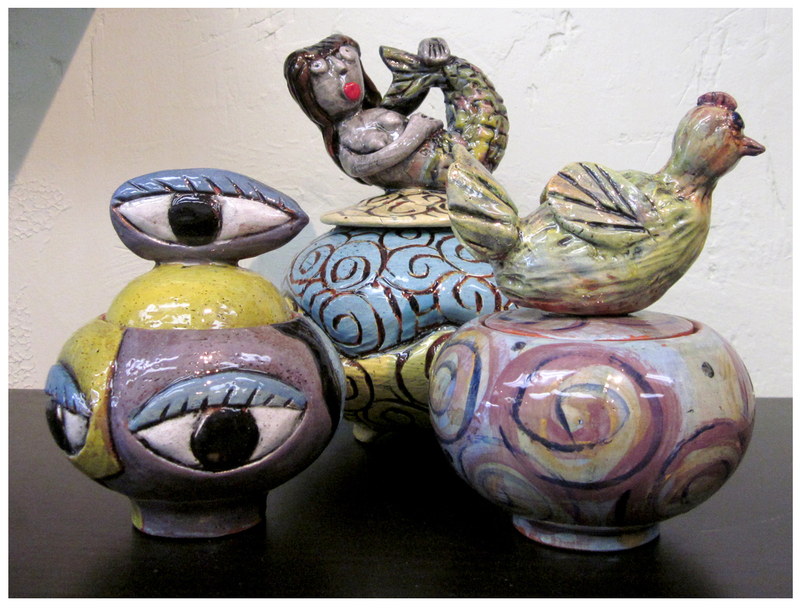 To my eye, these pots seem more organic in shape and design, and Lilia’s chosen graphic motifs add to that effect. Again, it’s hard not to run one’s fingers in the swirls and grooves of these pots. Not plantable, but I really loved these little covered vessels. I think I’ll have to visit Lilia again for the little all-seeing vessel; love that eye-lid! Next time you’re in downtown LA, stop in Lilia’s shop … it’s mere steps away from MoCA’s Geffen Contemporary, the Japanese-American National Museum, and the shops and restaurants of Little Tokyo. Thanks so much, Bianca … I’m really enjoying your posts, too… so many cool things, wish I lived closer! Always so splendid to find things that are one of a kind in our mass-produced world. I love these pots, I want to run my hands over all of them! I know that sounds bad, but I do! I especially like the one with the ponytail palm in it. Thanks for sharing!